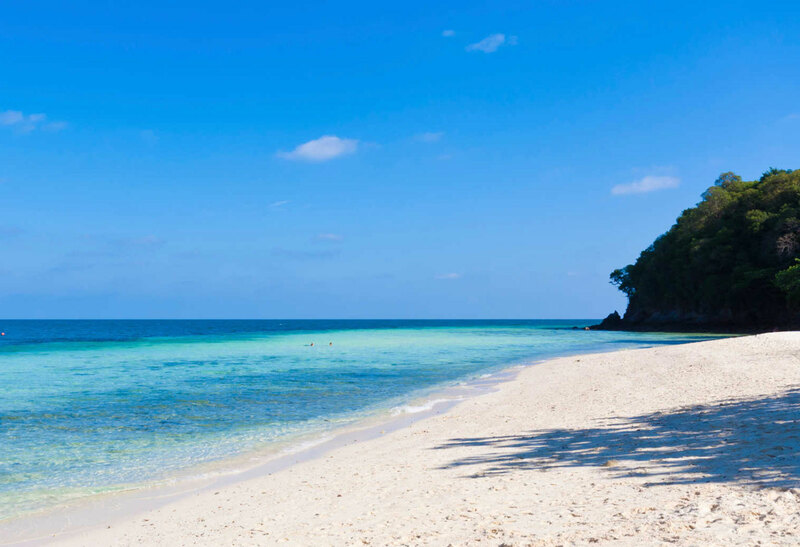 A nice option for a weekend away from Bangkok, especially if you’re on a budget or want to reduce your carbon footprint (no air travel), is the small island of Koh Samet. If you leave Bangkok early in the morning, you’ll be lazing in the sun in time for lunchtime cocktails. For my last trip to Koh Samet, I simply hailed a taxi from the (Bangkok) street who delivered us to the ferry at Ban Pae in 2.5 hours (2,500 baht, an alternative is to take a bus or mini-van for under 300 baht). The ferry trip is only 40 minutes (100 baht) until you arrive at sleepy Samet. Most of the island is a national park – requiring a small fee (200 baht) on entry and providing some trails to hike around the island. We headed straight to TubTim beach, a small, pretty and secluded beach which has become popular amongst gay and lesbian singles and couples. Our pleasant room at TubTim resort was directly next to the beach, offering lovely views of the ocean, sunset and a group of handsome muscular Thai guys who were also visiting from Bangkok for the weekend. My hands were full the entire time on Samet island – not with activities (my days consisting of lying motionless either in a hammock or on the beach) – but full of cocktails, good books, food and…well, I’ll leave it there. One afternoon we managed to muster the energy for a decent hike around the island as well as some snorkeling where we saw an array of colorful and pretty reef fish. The evenings at TubTim beach were very quiet, however a short walk to the next beach and there are several popular beach bars. Most of them have an evening fire show, the most noteworthy of which is the Silver Sands Resort show, featuring muscular Thai men spinning and tossing firesticks around as they get sweatier and sweatier. Excellent show! Relaxed beachside restaurants and bars can be found on all the beaches. They serve a variety of delicious Thai food and fresh seafood at very reasonable prices. Koh Samet is a lovely getaway from Bangkok. It is much quieter than the islands in the south of Thailand. As a result, you have to forego some of the luxuries and service which are offered in the south, so it’s not for everyone. There are various resorts dotted around the island offering accommodation to suit a range of budgets however TubTim beach is the gay and lesbian hub. Enjoy!